There are some people we love for the only one thing going right in their lives. For most of us our favorite musicians are a perfect example. The only thing going right for them is their music and some of us love them like life itself. For me, the people I love for the only one thing going right in their lives are all dead. And there's actually one musician in that list: Fela Anikulapo-Kuti. But today's post was inspired by another, in fact, one of the top two in that list. He is Oscar Wilde. Of all the authors I have read there are only three whose thinking blows me away: Mark Twain, George Bernard Shaw and Oscar Wilde. And Oscar Wilde leads the pack. He is the clearest thinker I have ever come across. The best writing I have ever read is "De Profundis" by him. And the most entertaining short play I have read is "The Importance of Being Earnest", also by him. 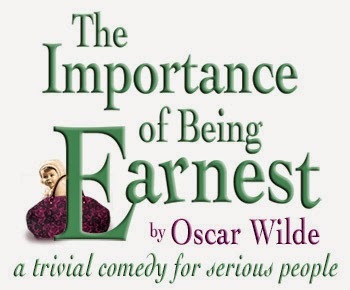 Though the play is a comedy and should probably be titled "The importance of Being Ernest", today's post is a serious one focusing on the value behind being earnest. First, let's define Earnest. To be earnest means to be sincere and serious in your actions and intentions. And for those of us who believe that honesty is the best policy, I need go no further in this post. So what is the importance of being earnest? What is the importance of being sincere and serious in one's actions and intentions? What is the importance of being always honest and diligent? Nothing is more rewarding than to laugh often and love much, to win the respect of intelligent people and the affection of children, to earn the appreciation of honest critics, to endure the betrayal of false friends, to appreciate beauty, to find the best in others, to leave the world a bit better whether by a healthy child or a garden patch or a redeemed social condition, and to know even one life has breathed easier because you have lived. (Elisabeth-Anne Anderson Stanley). Know another way to rephrase that? It is nothing is more rewarding than to be earnest. To live a sincere and serious life. Always honest and diligent. To be earnest.